What are three things that made Malcolm X a great leader? What made Malcolm X a great leader? it maked him a good leader becouse he had realized he was doing wrong and he decided to do better know. 1.HE CONTINUED TO DO WELL WHEN THE TEACHERS TOLD HIM NOT TO BE A LAWYER BECAUSE HE WAS BLACK. The three things that made him a leader is he became a muslam. He had done the good for the others. And he gave a speech for self-defence. 1) He fought for what he believed in. 2)He changed to become a better person. 3)He went through a lot of stuff to get to the top. His change him beein brave and his realness. I THINK MALCO X WAS A GREAT LEADER BECAUSE OF HIS CONFIDENCE ,HE WAS ALSO STRONG AND NEVER GAVE UP. That he is strong he fought for black and he didnt listen to people on what they told him. 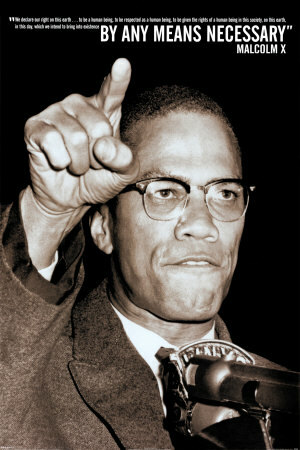 Malcolm X was a great leader because he stood up for his people and for wha they wanted.he was also a leader because after his father past he was there to take care of the family, finally he’s a great leader bacause he didn’t let nbody stop him from accomplishing his goals no matter what they told him. He had spoken the truth to the people around.He also is a leader because he had change his life around. One reason why he was a great leader was because he knew what he was doing to get his message out. Also because he was strong and courageous. HIS ERRORS IN LIVE MADE HIM A GREAT LEADER BECAUSE HE LEARNED FROM HIS MISTAKES.HIS FATHERS DEATH MADE HIM A LEADER AND HE EDUCATED HIMSELF. ¡THREE THINGS THAT MADE HIM A GREAT LEADER WAS WHEN HE WENT TO JAIL,WHEN HIS FATHER GOT KILLED AND ALL THA PEOPLE HE WAS SMART KNEW WHAT HE WAS DOING AND HE WANTED TO FIGHT FOR WHAT HE WANTED! Three things that made Malcolm X a leader was that he was a Muslim, he changed his life around in Prison, and he made a Speech. And His Strong Opinions On Why Things Were The Way They Were. 1.HE DID WRONG BUT AFTER HE STARTED TO DO RIGHT. 2.HE CREATED 2 ORGANIZATIONS AND THEY BOTH WAS AGAINST RACISM. 3.HE CONTINUED TO DO GOOD AFTER ONE OF HIS TEACHERS TOLD HIM NOT TO BE A LAWYER BECAUSE HE WAS BLACK. HE WAS A GOOD LEADER BECAUSE HE WAS DETERMINED, DEDICATED, AND WILLING TO TAKE CHANCES. THREE THINGS THAT MADE MALCOLM X A GREAT LEADER WAS THAT HE FOUGHT FOR WHAT HE BELIEVED IN . SECOND REASON IS THAT HE CHANGED HIS WAYS TO BECOME A BETTER PERSON. THIRD REASON IS THAT HE WAS LOYAL TO HIS PEOPLE AND HE FOUGHT FOR SELF DEFENSE. 3)He fought for what he believed in. He was one of 7 children and his father was killed by the kkk. Later on Malcolm x became a criminal and was sent to jail. There he managed to turn his entire life around. He then became a preacher, and a muslim. Malcolm x made his own orginization he also gave a message: that black people should defend themselves. the first thing he did was change his life around.The seconnd thing he did was try to help the world become a better place.The last thing he did was that he died tryin 2 prove his point. The speech that he did.. He fought for the black nation..
and he became a muslin …..
what made him a leader was his bravery.his courage,and his legacy. What made Malcom X a great leader ws that he always spoke the truth, he always took innitiative, and he never lied to anyone..
ONE THING THAT MAE MALCOM X A GREATE LEADER IS THAT HE DIDN’T LIKE THE WAY THE BLACKS WAS TREATED. AND HE TRIED TOFIX IT. I think what made Malcom X good leader was the way he went into prison and came out a better person. That shows you that people can change from a bad person to a good person. WHAT MALCOM X DID TO BECOME A GREAT LEADER IS THAT HE GOT GOOD GRADES WHEN HE WAS A LITTLE KID.HE ALSO EDUCATED HIS SELF IN JAIL AND ALSO HE READ THE HOLE DICTONARY. WELL I THINK THE THREE THINGS THAT MADE MALCOLM X AGREAT LEADER ARE THE HE BELIEVE IN ISLAM RELIGION AND HE WAS STRONG HE FOUGH FOR THE BLACK NATION………. hes smart ,he had a great speech and he wasnt afraid whwt might happen to him. THREE THINGS THAT MAKES HIM I GREAT LEADER IS HIS ENERGY TO HELP OTHERS,HIS WILLIN TO WORK,AND HIS PATIENCE. 1. )HE WAS SMART AND EDUCATED. 2. )HE WAS A PREACHER FOR A CHURCH IN ISLAM. 3. )MALCOLM X SHOWED GREAT LEADERSHIP. WHAT MADE MALCOLM SUCH A GREAT LEADER WAS BECAUSE HE WENT THRUOGH FAMILY PROBLEMS AND STAYED STRONG,RACISTS TEACHERS TOLD HIM WHAT HE SHOULDN’T BE IN LIFE,AND BEST OF ALL HE WENT TO JAIL AND REALIZED HE WAS DOING WRONG SO HE STARTED TO EDUCATE HISSELF. He became a preacher he turned his life around he adressed the problems in his community by giving a very famous speech. 2.He was driven and inspired. 3.he fought racism in America. I THINK HIM HAVING A BAD CHILD LIFE MUST HAVE HELPED HIM AS AN ADULT.AND,THAT MUST HAVE MADE HIM A GOOD LEADER. What made Malcolm X a great leader is that he overcome the bad things he did in the past when he was in jail which was doing drugs and gambling in a young age.He also decided to give preached about self-defense and for African-Americans to know what were there rights. THE THING THAT MADE HIM A LEADER WAS THAT HE STANDS UP FOR HIS RIGHTS AND HELP OTHER PEOPLE AND ALSO HE BECAME A PREACHER……. he stop duing drugs in jail,he became a muslum,and he helped a lot of black people. He had respect for people he started over and started doin whats right and he fought for black people rights. I think going to jail made him a great leader, joining the nation of Islam, and being the supporter for his family all made him the Great leader he was. The things that made malcolm X aleader is that he is brave and stands up for his community. THAT HE CHANGE BY GOING TO JAIL. HE WAS MAKING SPEECH TO SHOW THE POEPLE WHAT IS GING ON. ALSO THAT HE MAKE A MUSLIM AND WAS DO BETTER. i don’t know because i was absent when you guys we’re learning this!!!! The things that made Malocm X a great was that he change his life around in prison,hes confident,and he showed respect. the three things that made malcolm x a great leader was that first that he changed his life completely changed his life around, second was that influenced the black nationalism and third he spoke what thought and he was killed for what he believed in. Malcolm kept on going with life although he was offended by many from different race.Malcolm did what was possible to keep up and not fall down on himself.He continued his life although it was a big change when his father died. He started in jail.That’s how he changed his last name to Malcom X. He also joined a group called Black Nationalism. He even became a full muslim after he left the B.N. The B.N, was very upset w/ Malcom. that he was a great person and wen he went to jail he went to school ……..
What made Malcolm X a good leader is that he was brave, smart and he believed in self-defense. he was a great person and when he went to jail he went to school. Change His Life And The Lifes Of Others. He’s Also Infamous For His Speeches. it made him al leader when he wen to jail and came out and started changing he also belived i self defends and he also went to school which also makes him a leader. One is that his teacher was racist to him,but he didnt care..Also he was a smart man.He continued after what the teacher told him. The three things that made malcolm x a great leader was going from being a pimp, gambler,and a robber and going tojail and changing hois lifd arund. also for figghtin for black people rights. The tree thigs I listed was noble,strong,and caring. He is noble because he tres hes best in everthing. Caring because he cares about eveyone. FIRST THING THAT MADE MAULCOM X A BETTER LEADER IS THAT THEIR WAS TEACHER THAT WAS RACIST TO HIM,WENT TO JAIL AND BECAME A SPEECHER. while he was in jail. IFEEL THAT THE THINGS TT MADE HIM A GREAT LEADER IS THAT HE IS LOYAL , HONEST , AND CARING .HE WILL ALWAYS TRY TO HELP OTHERS ANDHE BELIEVES THAT EVERY ONE CAN MAKE A CHANGE(OBAMA!!!). WITH OUT HIM MOST AFRICAN AMERICANS WILL PROBABLY STILL BE DISCRIMINATED AGAINST . three things that made him a leader was that he helped alot of people and he was brave …. well i think him not paying a tenchin to what the white races teacher had to say.and the kkk kiling his fother.also he was bad and he became better and good and he will always fallow his dreams. I think what made him a leader was that he wanted to change for good. And that he change his life around in prison. i think both of them becUSE i like both there ideas but some i didnt agree with.